Kirby poses with a class of students at a permaculture design course at Heirloom Blooms. Photo by Melanie Strang-Hardy. Last week we introduced the food forest as a great way to leave an awesome trace in the world – a perennial forest gardening system designed to provide organic food and other resources while regenerating the natural environment around it. Today, we will be speaking with a man who spearheads the establishment of food forests all across central Texas, at homes, schools, community centers, and businesses. 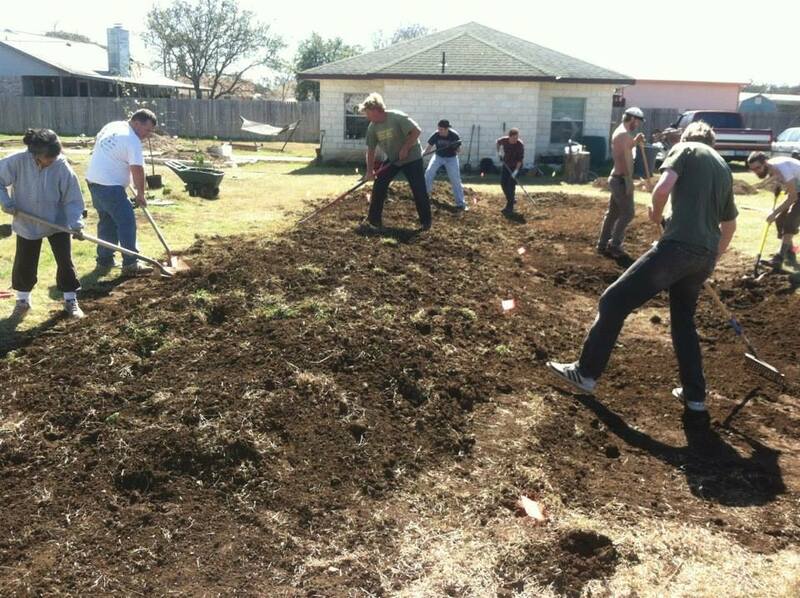 Kirby Fry has been practicing Permaculture for over 20 years, and helped to introduce the Permablitz model to the Austin area. 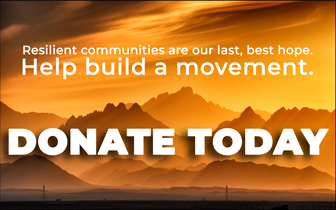 In essence, Permablitzes are community gatherings where groups of volunteers descend on a site for a weekend to build, implement, teach, and learn Permaculture design through direct action by collectively establishing a small food forest. 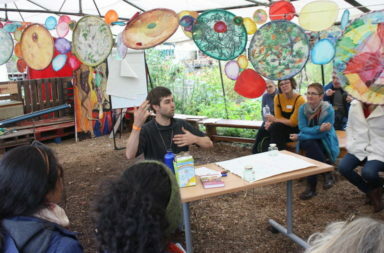 Having been to a few of them myself, I can say they are hugely fun, highly informative, and a fantastic way to connect with community and demonstrate the awesomeness embedded in Permaculture. Let’s hear about Kirby’s story and what inspired his personal journey. 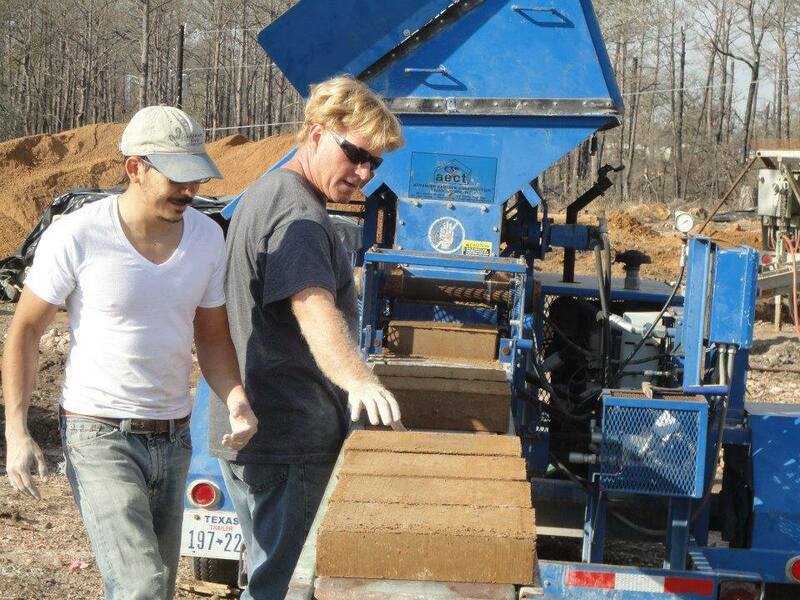 Kirby on a work site inspecting compressed earth blocks, a great natural building material for green housing. Image courtesy of Kirby Fry. Hi Kirby! Can you start off by telling us a bit about yourself and how you got involved with Permaculture? Kirby: Growing up as a teenager in Houston, Texas, my family, friends, and I would go camping a lot. My mom and I would go tubing down the Guadalupe River every 4th of July from the time that I was eleven through my college years, and my friends and I would go camping and rock climbing every holiday at Enchanted Rock State Park, Hueco Tanks State Park, Guadalupe Mountains National Park, and Big Bend National Park. When I graduated high school my mom sent me to the Wind River Wilderness Area in Wyoming to take a month-long course with the National Outdoor Leadership School. There came a point during all of this camping and climbing that I realized my love for nature translated into more than just wanting to recreate in it, I now wanted to make a difference during my life and do something to protect it. So I chose to study Natural Resource Conservation at Texas A & M University and try to make a career out of managing natural resources. At that time I was pretty sure I would end up working in the public sector. When I graduated university in 1989 I signed up for the US Peace Corps and was assigned to work in agro-forestry in Guatemala. The first time I ever heard of permaculture was from a couple of co-workers when I was working for Clean Water Action in Austin, Texas, waiting to ship out to Guatemala. My co-workers suggested I attend a talk about permaculture given by Patricia Michael at the University of Texas during Earth Day. It was an interesting presentation but I wasn’t quite hooked yet. Upon returning from the Peace Corps I was full of new hopes and dreams, but a bit less interested in working for governments after seeing how “the sausage was made” in the Peace Corps. The Peace Corps put its volunteers into narrow disciplines – agro-forestry, aquaculture, appropriate technology, community health, wildlife conservation, etc.- and spread its volunteers out all over the country, rarely ever taking a holistic approach. I would have loved to stay in the village I worked in for many more years implementing more projects, but just as I was really getting established in Guatemala my time was up and I was headed home, full of dreams and ideas but also pretty broke and looking for some fast cash. To make some quick money, many Peace Corps volunteers end up working as observers or low level marine biologists for the Alaska Department of Fish and Game on crab fishing boats in the Bering Sea. I spent nine months over two winters working on crab fishing boats for about $150 per day. While out at sea during my first fishing season, I learned about the Earth Summit / Global Forum being held by the United Nations in Rio de Janeiro, Brazil, and knew I had to go. When that first fishing season was over I was off to Brazil, and while on the road traveling from Washington state to Texas a friend in California gave me a few Pacifica Radio interviews of Bill Rolley, Nadir Khalili, and Bill Mollison. I listened to these interviews over and over while on the road, and after hearing Bill Mollison describe what he meant by permaculture and sustainable design, I was completely sold and now had a much clearer picture of what I wanted to do with my life. I arrived in Rio de Janeiro, Brazil, in May of 1992 for the Global Forum. It was an amazing experience, but once again I was an outsider, speaking a second language, with a visa about to expire after living there for six months. It was time to go home, work within my community, and settle down closer to family where I could help take care of my father and grandmother who were ill.
Only a few months after getting back to Houston in 1993, a friend working with Treesearch Farms handed me a flyer announcing that Bill Mollison himself was coming to Texas to teach a permaculture design course at Fossil Rim Wildlife Center in Glen Rose, Texas. I ended up living and working at Fossil Rim Wildlife Center for over three years, taking three design courses with Bill, an earthworks course, and an advanced teacher’s course. I’ve been teaching permaculture and implementing sustainable design ever since. 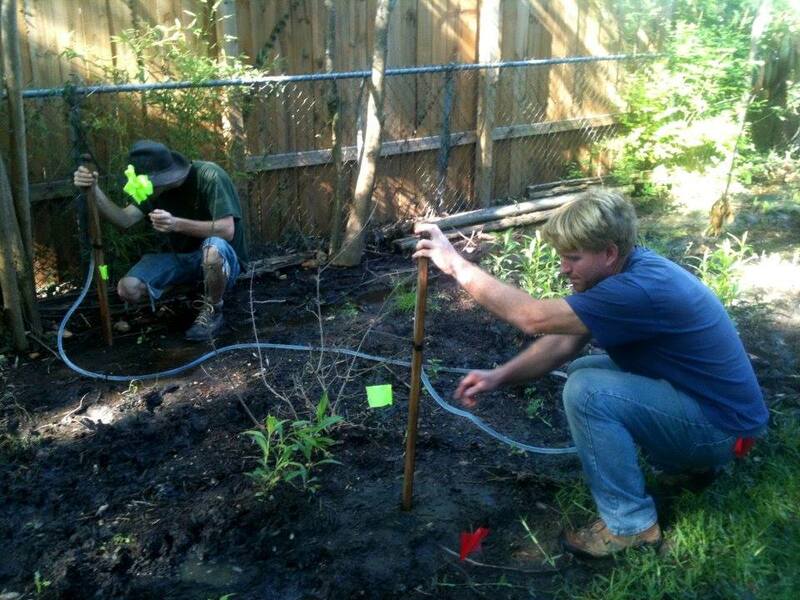 Kirby and a friend check the contour of the land with a water level – an important step in designing good passive water catchment. Image courtesy of Kirby Fry. Tell us about Permablitzes. What are they exactly? Kirby: A permablitz is a group of volunteers getting together to install an edible perennial garden over the course of a weekend. The permablitzes also serve as a way of keeping sustainably minded folks learning and working together. One thing I noticed early on about taking permaculture design courses was that a lot of folks would get really excited about sustainable design during the course, but quite often, six months or so after taking the design course, people would slowly start assimilating back into their conventional lifestyles and permaculture would become this really cool thing they learned about but often had a hard time implementing in their lives. Then, I brought up to one class of design course graduates that we needed a way to stay in touch and keep each other informed of our successes and failures, and let one another know about opportunities to get involved in more permaculture projects. 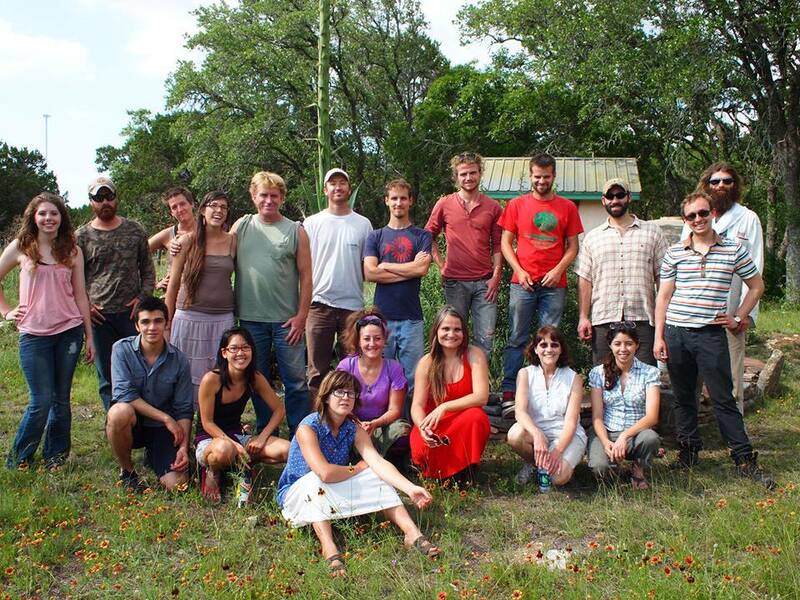 So an associate named Dilek Wise created a Facebook group called Texas Permaculture Design Projects. She also told me about this event called a “permablitz” that folks in Melbourne, Australia, were doing. That’s when I first learned about permablitzes. Our Facebook group was up and running for a couple of years or so before we had our first permablitz. The momentum needed to kick off the first permablitz was gained at the Food Forest for All workshop taught by Caroline Riley, Michael Wolfert, and myself during November and December of 2012. I brought up the concept of the permablitz during one of my presentations and a fellow attendee, Kurtis Colona, said he was all in if I made a blitz happen. That was all I needed to hear. We’ve been permablitzing for two years now. The design ethic embraced by permablitzes includes care of the earth, allowing no soil erosion on the site and encouraging soil to actually build up and become richer over time. The design principle embraced by permablitzes includes getting the biggest bang for your buck, relying primarily on perennial food plants like fruiting trees, vines, and bushes, more than relying on annual vegetables – though both are planted at every permablitz. Admittedly, I held the design reins pretty tightly for our first year of blitzes. If I was going to be putting up money for plants and other supplies and give up my weekends, then it would have to be for what I believed to be the most solid design principles of permaculture. So every blitz would have swales and berms / conservation terraces and incorporate support species (cover crops, dynamic accumulators, and farmer’s trees), soft rock mineral amendments, and a drip irrigation system. The blitzes are not just about sticking fruit trees in the ground or building annual vegetable beds. The blitzes are about building earthworks and soil conservation structures that will continue to work for hundreds of years in the future, creating an agriculturally productive ecosystem. Once a member has attended three full permablitzes, they get their name in the queue to have a blitz held on their property, and are expected to cover the costs of materials. We also built our own propagation house on Kurtis and Linda Colona’s property where we take care of plants that we purchase in bulk at wholesale costs. Creating a perennial food forest garden at a Permablitz. Image courtesy of Kirby Fry. Where are some of the locations that you’ve held Permablitzes at? Does your approach change depending on the site? Kirby: We have had permablitzes at the Austin Ecoschool, the city of Sunset Valley, Kealing Middle School, the Mobile Loaves and Fishes village, the Yellow Bike Project, Dunbar Neighborhood Garden in San Marcos, and several of our members’ properties – Linda and Kurtis Colona’s property near Manchaca, Sacred Roots in San Marcos, Quilombo Paixao in Cedar Creek, and out at my place, which I call “the Land” near McDade. The topography and soils types may change but the formula for how we execute a permablitz is constant. Using a water level or radial laser level we lay out contour lines on the site and excavate swales and berms along those contour lines – the earthworks are usually 16’ wide and 48’ to 120’ long. Typically a third of the trees we plant are leguminous nitrogen fixing “farmer’s trees” that don’t yield food but help build the soil and passively support the species that do. We also plant perennial food plants that will do well here in Central Texas such as blackberry, grape, asparagus, artichoke, strawberry, and sweet potato, as well as native flowers that attract pollinators. 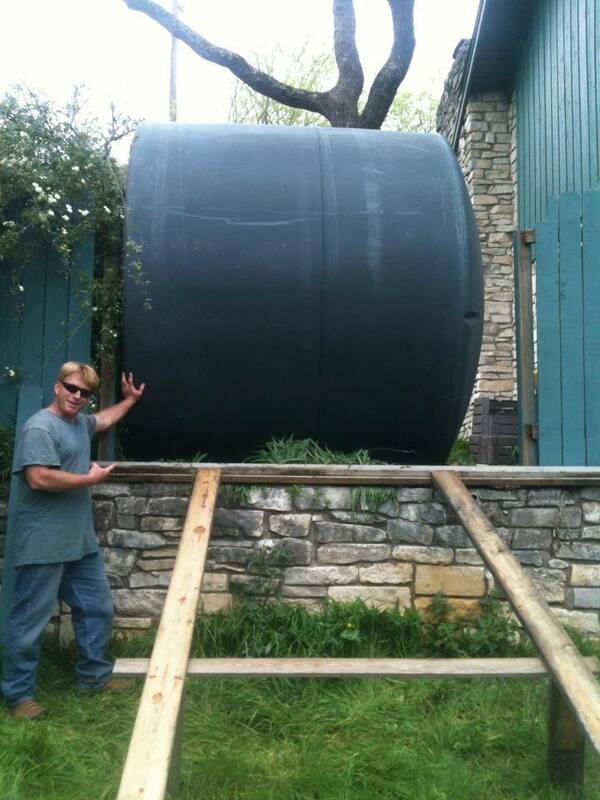 Kirby poses with a big rainwater catchment cistern. Capturing rainwater is one of the keystones of self-reliant, sustainable living. Image courtesy of Kirby Fry. What is the overall vision behind doing these Permablitzes in the community? What do you most hope to accomplish or inspire in people? Kirby: The vision behind doing these permablitzes in the community is to give anyone who wants it the hands-on experience they will need to be able to confidently build a perennial food garden for themselves and host a permablitz anywhere they go. The blitzes are also job training for those who want to make permaculture design their livelihood. The broader vision for the community is that anyone who wants a perennial food garden should be able to have one through the permablitz network or by hiring someone who has gained design experience from participating in our design courses and permablitzes. The permablitzes have an exceptionally high yield of good designers and teachers. I hope to inspire in people the belief that they can give back to the earth more than they take and that by good design they can actually build an agriculturally productive ecosystem better than nature. This belief moves from the realm of theory to reality when we get together as designers and installers during the permablitzes. Do you have any upcoming events that people in the Austin area or elsewhere can get involved in? Kirby: We will be permablitzing at Travis Elementary School in San Marcos, April 15th and 16th. Taelor Monroe’s web site, Austin Permaculture Guild, posts our event notices, as well as Selwyn Pollit’s web site, Austin Progressive Calendar. Often we don’t know where we are blitzing until a few weeks before the event. We have a couple of sites in mind for April, but are still undecided. Once May comes around, it’s really getting too late to put fruit trees into the ground, so we go back to our established gardens and do upkeep tasks like weeding, harvesting, irrigation maintenance, and sowing summer cover crops. Anyone interested in learning more about permablitzes should also join our Facebook group, Texas Permaculture Design Projects, where I post quite regularly. Bringing it All Together in Just. One. Diagram.